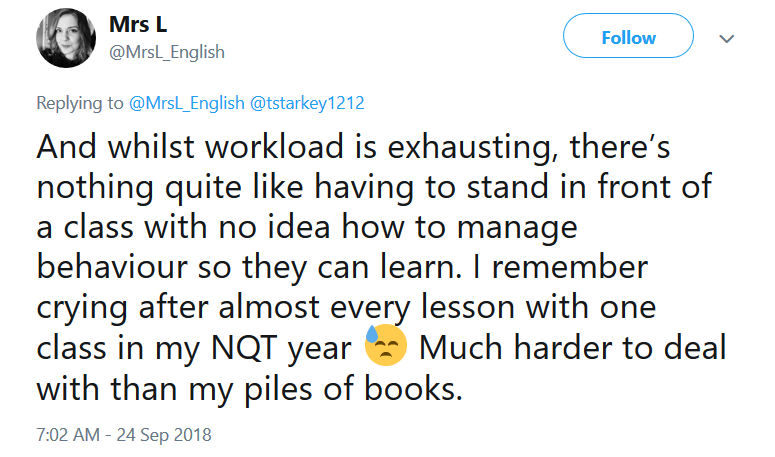 Much of my blogging, since I decided to get into teaching some three years ago, has been concerned with the subject of poor behaviour in schools. I’ve been banging on about it so long that I must at times have sounded like a scratched record. And while there have been some sympathetic ears, my overwhelming feeling has been that the behaviour issue is often downplayed and not taken particularly seriously. I hear a lot of outrage from some quarters about cuts or about tests, but when it comes to the massive issue of behaviour: silence. So I’m rather pleased that we’re finally talking about it. As far as I’m concerned, behaviour is the number one issue at the heart of many of our problems in education. Sort out behaviour and in one fell swoop, without making any other changes in your school, attainment will rocket up. Sort out behaviour and you’ll finally plug the haemorrhage of teachers from the profession. Staff absences will also miraculously reduce. It is no accident that the majority of schools that needed my services when I did supply work were schools with behavioural issues. Sort out behaviour and your teachers will be able to actually teach rather than fire fight. It is a complete no brainer, and yet so many school leaders still don’t accept that it is their primary responsibility to ensure that their schools are safe, calm spaces to work in. Sorting out behaviour is not exactly rocket science. Several schools in this country do it very well. 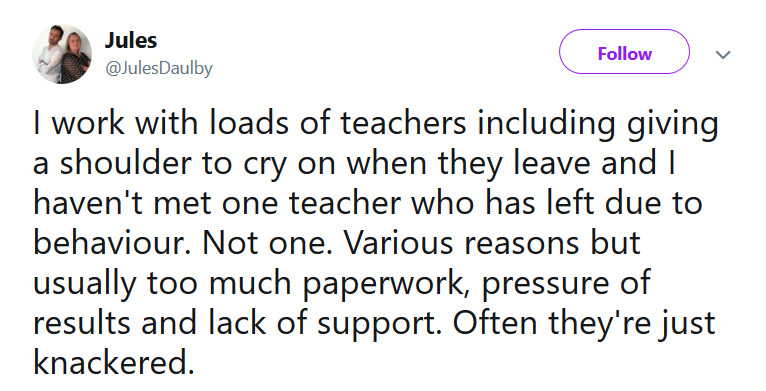 At the very least, school leaders could go visit them and learn a thing or two. But really, what are we talking about here? Having high expectations of your students (beware the soft bigotry of low expectations – just because children come from poor and socially disadvantaged backgrounds doesn’t mean they can’t behave). Devising clear, simple rules, communicating them to students and staff, and then rigorously enforcing them for a consistent approach. It is eminently do-able. Sort out your systems first, then look at individuals. Without functioning systems, you’ve no idea what people can do. Great teaching can only be enabled if systems support great teaching. And Ofsted, please, please, make school leaders accountable for behaviour. I still haven’t forgotten how one of my previous schools – with shockingly terrible behaviour – could proudly emblazon its front gate with a quote from an Ofsted report saying “Behaviour is good”. Scratch a little more under the surface and find out what behaviour really is like before making such stupendously incorrect statements in your reports. Just, for goodness’ sake, sort it out.